Mac OS X updates are huge with the installation files running into several gigabytes. The same is true for Mac apps like iMovie or Microsoft Office that have massive installers. The problem is compounded when you own multiple Mac computers and you need to upgrade them all to the latest OS X update. It will not just take too much time but you may end up consuming your monthly download bandwidth. A simple and obvious workaround to the problem is that you download the installer files on one Mac machine and then transfer the downloaded apps to all your other systems through AirDrop or WiFi. The Apple website says that “Apps [downloaded] from the Mac App Store may be used on any Macs that you own or control for your personal use.” This is however easier said than done. You download a 5 GB Mac OS X installer from the App Store, the machine restarts, your system is upgraded to Mac OS X Yosemite or El Capitan but wait, where has the installer disappeared? Your Mac, in a bid to save space, deletes the original installer automatically after the upgrade and thus you cannot reuse it on other machines. To get around the problem, after the installer has downloaded, quit the installation routine and do not restart the machine. Go to the ~/Applications folder on your Mac, find the installer file and Option+Drag it to another folder like ~/Downloads to make a copy that will stay even after the machine is restarted. For minor updates, like OS X 10.10.8 or 10.10.9 updates, Apple releases standalone installers as .dmg files that you can download once and install on multiple machines. The releases are available as incremental updates (containing only changed files) or combo updates (all changed files since the last major release). A simple Google search for “download mac ox x 10.10. combo” will reveal the direct download links for the .dmg files on the Apple support website. In the case of apps downloaded from the Mac App Store, you’ll find the .app files in your /Applications or /Users/username/Applications folder that you can easily copy to your other Mac machines. Internally though, the App Store downloads the installer as a package file (with a .pkg extension) and this will not reside in the Applications folder but in a separate hidden folder. Now open the Mac App Store app and you’ll see a new Debug menu (see screenshot). Click the “Show Download Folder” menu and it will open the location of the download folder inside Finder where the Mac apps are temporarily download. You can find the .pkg files inside one of the sub folders that you copy to your other Mac systems via Airdrop. 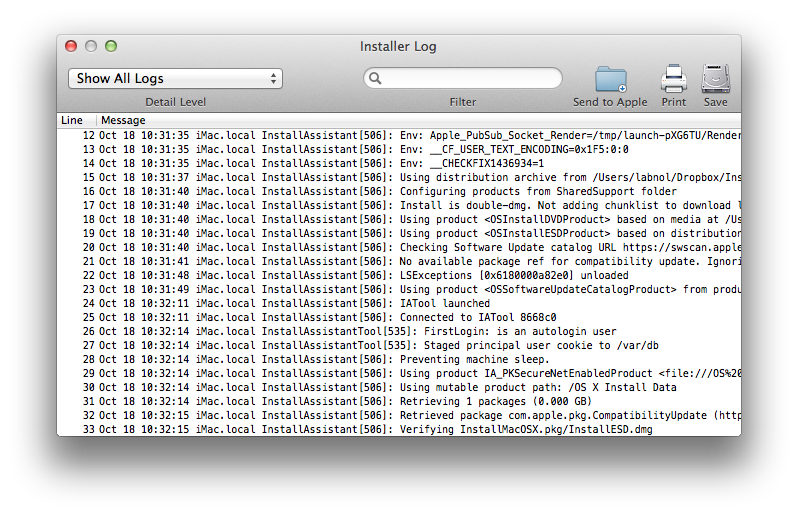 [Bonus Tip] If you are upgrading to a new version of Mac OS X, like the upcoming El Capitan, press Cmd+L at the installation screen and it will open the installation log so you know what’s exactly happening behind the scene.